Sydney FC star and former Coerver® kid, Terry Antonis has completed a move to Serie A after agreeing personal terms with Parma on a four-year contract. Terry, who featured in numerous Coerver® Coaching DVD’s from the age of 7 years old, travelled to Italy with his father Peter Antonis and after meeting with the Italian club’s management team, he agreed to put pen to paper for the club that was home to former Australian internationals, Vince Grella and Mark Bresciano. It is understood that the A-League club was reluctant to let Antonis go, but the sum offered by Parma triggered a release clause in his contract (see below photo of Terry playing for Australia Vs Spain). Terry said of his move to Italy “It’s always been my dream to play in Serie A and I couldn’t be happier, it’s a fantastic set up over here and a huge opportunity for me to further my career. To be joining the same club that Vince Grella and Mark Bresciano played for is a privilege and I hope I can taste some of the success they enjoyed in Italy”. Terry added “It’s a club with great tradition and hopefully I can take my game to another level here and add to my football education. I also want to thank Sydney FC and especially Alessandro Del Piero (see below image) and Pascal Bosschaart who have been really influential and have helped me so much in my time at the club”. Assuming everything goes to plan, Terry will officially join Parma – coached by Italy international Roberto Donadoni, when the transfer window re-opens on 1 July 2013. The 19 year-old won’t link up with his new teammates until after the FIFA Under-20 World Cup which runs from 21 June to 13 July in Turkey where he will captain the Australian national team. Sydney FC were believed to be keen on selling Antonis to FC Utrecht for a higher sum, having agreed to send him on trial to the Eredivisie club. When Parma came calling the decision was made easy for Antonis who will become the second Australian currently playing in Serie A, joining Australian International midfielder James Troisi who plays for Atalanta. Everyone at Coerver® Coaching is extremely proud of Terry’s achievements, and he adds his name to the long list of players to have developed under the Coerver® programme and have gone on to fulfil their dream of becoming a professional footballer, WELL DONE TERRY!. 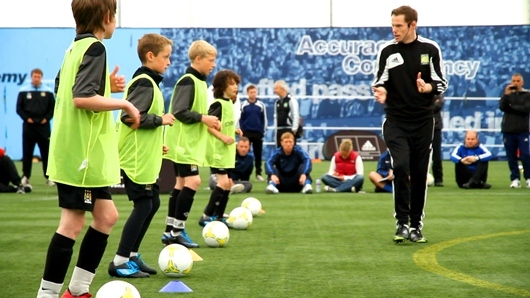 With the launch of the 2013 Coerver® Coaching Youth Diploma courses in England just over 2 ½ weeks away, we are pleased to announce that the course at Fulham FC on Saturday 15th & Sunday 16th June 2013 is now sold out. Coaches from all levels of the game and from all over the world will descend on three professional club venues in London, Birmingham & Stoke during June 2013. 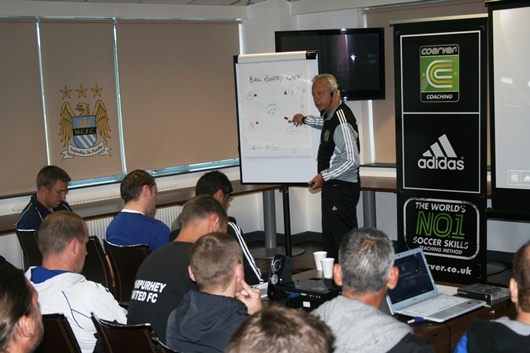 Course attendees taking part on the on the highly respected 2-day course will be provided with expert tuition from Coerver® Co-founder, Alf Galustian (see below image 2012 Coerver® Youth Diploma – Manchester City FC). At the time of writing there are now only a handful of places remaining for the course at Birmingham City FC on Saturday 1st & 2nd June 2013. Availability for the course at Stoke City FC on Saturday 29th & Sunday 30th June 2013 remains good although we are expecting that all Youth Diploma course dates will be sold out by the end of May 2013. Coerver® Coaching UK Director, Scott Wright (see below image working with Manchester City U11’s at the 2012 Coerver® Youth Diploma) said “Participation numbers and general interest for this year’s Youth Diploma Courses here in England from both a national and international perspective has been phenomenal. As it stands we have coaches coming from many different levels of the game and from around 23 different countries across the world which really highlights the global demand for the Coerver programme”. Scott added “We fully expect that the three scheduled courses will be completely sold out before the end of May. The dates in Birmingham, London and Stoke in June are the only Youth Diploma courses that we will be delivering in England during 2013 so I would strongly advise anybody that plans to attend but has not yet booked a place to do so within this period to avoid disappointment”. Since the Coerver® Coaching Youth Diploma, in association with FourFourTwo Performance, launched in 2011, over 800 coaches from all levels of the game and from across the world have participated on the 2-day course. The 2013 Youth Diploma courses are set to be the biggest and best yet with a wide range of attendees that includes grassroots coaches, teachers, professional youth coaches and professional coaches working at senior level both nationally and internationally. The Coerver® Coaching Youth Diploma course not only provides a rare opportunity to learn from Alf’s 30 years of global youth development experience but also the opportunity to participate on an official, authorised Coerver® Coach Education course, which through the Youth Diploma has been the first time in the organisations 29 year history where this opportunity has been available to external coaches. The purpose of the Coerver® Coaching Youth Diploma is to give attendees, from all levels of the game, a greater understanding of how to plan & deliver more effective coaching sessions. The focus of the course is the Coerver® Coaching Session Planner which provides a quick & easy solution for coaches who would like to construct weekly, monthly or even season long programmes using proven, high quality drills & games developed over 29 years by Coerver® Coaching. Coerver® Co-founder and course tutor, Alf Galustian (see above image), said of the course “We had never had an authorized Coerver® pathway for Coaches until the last year, and we’ve been around 29 years, and we’re in 23 countries. Our new Diploma course is designed for Coaches who work with young players from 8-15 years old. We designed the diploma asking the question, how can we help coaches construct sessions for the week or the whole season?. The new Coerver® DVD’s and books Charlie Cooke and myself have devised, which is called the Coerver® Coaching Session Planner; is a formula that any coach can use to construct their season’s sessions, we have built the diploma course around this new material”. “These last two days on the Coerver® Coaching Youth Diploma course certainly made me a better coach, I have been a fan of Coerver® for many years”. “The foundations of great teaching have always been championed by Coerver® who have taken football and created a system by which any child, through hard work and good teaching can master the basic ball skills, that then lead onto their application in skilful play. “I enjoyed the Coerver® Coaching Youth Diploma course immensely, I feel the course did show me some variations on familiar themes and I enjoyed how both Alf and Scott presented the course”. “I thought the Youth Diploma course was excellent, Coerver® is the building block on which all football should be taught. I thoroughly enjoyed the course and it has really encouraged me towant to become a better coach”. 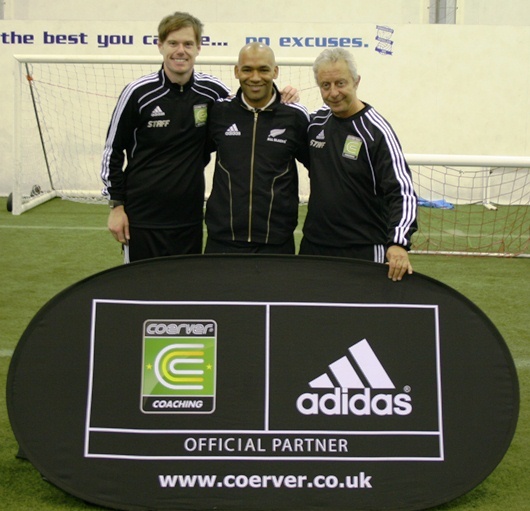 “I thoroughly enjoyed the Coerver® Coaching Youth Diploma course, and would recommend that all coaches working with young players should attend”. 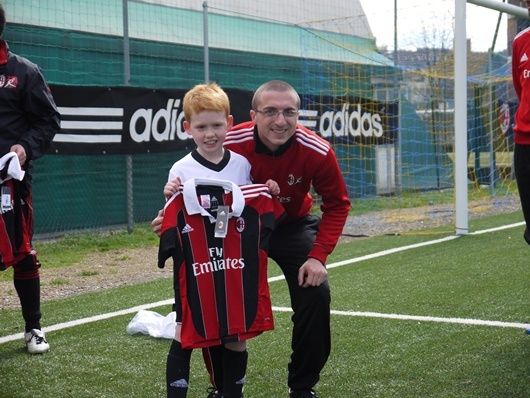 Over 100 players, parents and coaches from the Coerver® Coaching UK Performance Academy programme have recently returned from the trip of a lifetime with Italian footballing giants, AC Milan. time to squeeze in some sightseeing around the city which is truly one of the world’s greatest with it’s unique cultural blend of art, history, fashion & food. 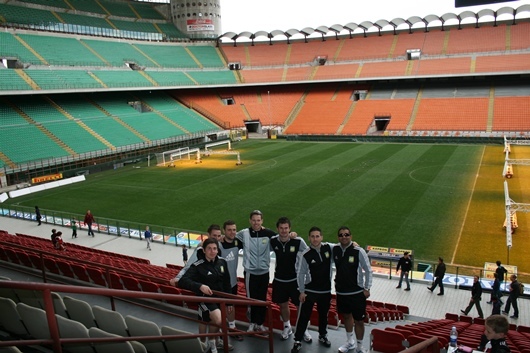 Coerver® Coaching UK Director Scott Wright said of the trip “Our Coerver Pro tour to AC Milan was an overwhelming success. Only a very small percentage of players in the world would get the opportunity to train somewhere as prestigious as AC Milan but through the various relationships we have within the game, we are able to arrange these once in a lifetime tours to the world’s greatest clubs for all players and parents within our programme, this is definitely one of the real benefits of being involved with Coerver” (see below image). Scott added “It is not just the football side of things and benefitting from working with coaches from a different football culture (see below image), the whole social experience that a trip like this provides is really valuable and it really is something that the players and parents will never forget. We brougt our film crew along with us on the tour so those memories and experieces have been captured on film which is now avaliable to view on our website and You Tube channel which is great. We have had fantastic feedback following this trip and we are now busy planning our Pro tour for next year”.